LG GPad 8.3 vs LG GPad 7.0: Which one is the best? Last year LG made a comeback in the tablet world with the surprisingly good and stylish LG GPad 8.3. The 2013 LG Tablet used premium materials and was high in specs. In 2014 the situation has changed for LG. The Korean firm has launched 3 new tablets (all with similar specifications) in different sizes: 7.0, 8.0 and 10.1. A few months ago I wrote a complete review about the the LG GPad 7.0 (click here to read the review). For the last 2 weeks I have been using exclusively the LG GPad 8.3 (2013) and I am really impressed with the tablet. So I decided to launch a battle: LG GPad 8.3 vs LG GPad 7.0. Are you ready? Here are the results, and hopefully it will help you if you are thinking about buying a LG tablet in the future. I decided to compare both tablets on the following areas: Build quality and design, Screen, Battery Life, Speakers and UI- Overall performance and both tablets are running Android Kit Kat (LG GPad 8.3 has an upgrade ready). The LG GPad 8.3 (2013) and the LG GPad 7.0 (2014) are very nice tablets. Both are well built and they feel more premium than any Samsung Galaxy, Lenovo tab, Acer tab (not that difficult!) or even the Nexus 7. The quality of material used on the tablets is different. The rear of the LG GPad 8.3 (2013) has a mix of premium metal and plastic which reminds me of the iPad mini. The LG GPad 8.3 (2013) is on the heavy side (338gr) but it feels very sturdy and premium. At less than £200 it is probably one of the best built Android tablets out there. The LG GPad 7.0 (2014) is the new generation of LG Tablets. This time LG has decided to go full plastic. When we think about tablets made of plastic we immediately think about the range of Galaxy Tab by Samsung with quirky noises and cheap looking. The LG GPad 7.0 is in another league. The back is made of 100% plastic but it feels premium. In a way it looks like a big Nokia Lumia phone which is a good thing because Nokia is extremely good at building phones. 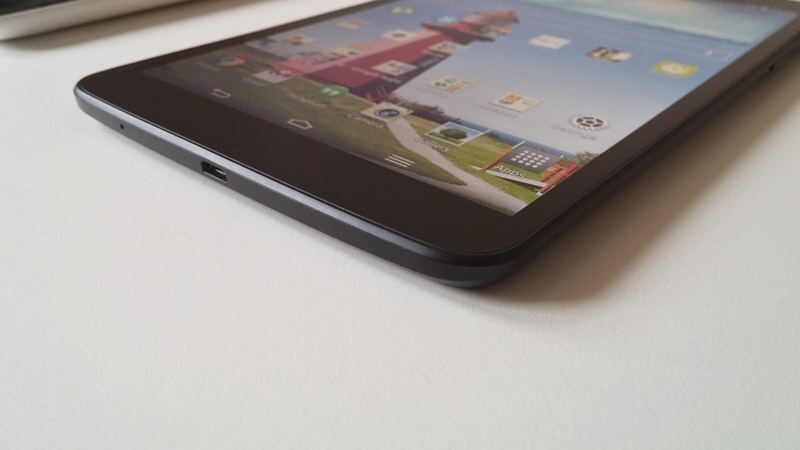 The GPad 7.0 has a price tag of £100 and without a doubt it is the best built budget tablet. Who is the winner? In my opinion the LG GPad 8.3 is the winner because the overall feeling is superior, but the LG GPad 7.0 is not far behind. Both tablets are impressive on the build quality side! Apart from the obvious screen size difference (all the new LG tablets 2014 have the same screen resolution), you will immediately notice that one is full HD and one is 720p HD. The screen on the LG GPad 8.3 (2013) is fantastic. The full HD is perfect for the size of the tablet and with a pixel density of 273 and a screen resolution of 1200x1900 you will love it. Viewing angles are excellent and the colour reproduction is amazing. The screen resolution is not as high as the Nexus 7 but colour reproduction is better in my opinion. I never found watching Netflix on Nexus 7 an amazing experience (I am sure I will upset a lot of people here!). Of course there are better screens out there, the iPad Mini retina display or the new Galaxy Tab S, but only the LG GPad 8.3 can give you such a great screen for less than £200. This year LG has decided to downgrade some specs of their new range of tablets, and one of them is the screen resolution. It's a shame because at the end of the day, one of the most important aspects of a tablet is its screen resolution. The LG GPad 7.0 has “only” a 1280x800 IPS display. Last year Motorola showed the world that a 720p display could be great (Moto G) and it looks like LG has learned from them. The screen of the GPad 7.0 is very nice, colours are vibrant and it has a very good viewing angle. Of course you will notice the difference if you put the GPad 8.3 next to the GPad 7.0, but for £100 you get a lot of screen for your money. There are so many £100 7” Android tablets with washed out screens (Lenovo, Acer for example), but don’t worry because this is not the case. The winner is obviously the GPad 8.3 (2013) with its beautiful HD screen, but the LG GPad 7.0 has one of the best (if not the best) screen for a budget tablet. Watching Netflix on the GPad 7.0 is a very enjoyable experience. It is obvious that LG knows a lot about screen quality. The LG GPad 8.3 (2013) has a battery of 4.600mAh and the LG GPad 7.0 (2014) has a battery of 4.000mAh. I really think that the GPad 8.3 needs a much bigger battery. The full HD screen needs a lot of power and unfortunately the battery on the GPad 8.3 is on the short side. Obviously it all depends on what you do with your tablet. But I am a moderate tablet user (as I work almost all day on my Chromebook) but I find the LG GPad 8.3 will never last a full day. Worst still...it takes an awful long time to charge. Personally I am not really impressed with the battery of the LG GPad 8.3 (2013). I always hated the poor sound quality of the iPad 1-2-3 and 4. A tablet is an excellent device for media consumption so good stereo speakers are very important, and unfortunately very often manufacturers don’t put enough attention in that area. So far the best speakers on a tablet were the Blackberry Playbook, HP Touchpad, the Motorola Xoom, Nokia Lumia 2520 and some Samsung Galaxy Notes. So will this change with LG? The LG GPad 8.3 (2013) has two stereo speakers located on the back of the device. They offer a good sound quality, loud and quite clear. We are still far from HiFi stereo sound but for a tablet it is actually good. You can easily watch a movie on Netflix or TV show on Hulu Plus using the internal speakers of this tablet. With the LG GPad 7.0 (2014), LG has changed the speaker placement. Now they are located at the bottom of the device (by the USB charger plug). Unfortunately the result is not that great. The sound is very quiet and I always use my headphones to watch a movie with it. Without any doubt the LG GPad 8.3 (2013) is the winner and the sound is much better. In an Android world dominated by high specs processors, it feels like the tablet market is always left behind by sub par specification. It is easy to find outstanding Android Smartphones with great user experience but not with tablets. Android tablets always have some lags or hiccups, and this starts to get annoying. Maybe Google should start to develop a version of Android specially designed for tablets? So what about the User Interface and the experience with LG? The LG GPad 8.3 (2013) is now on Android Kit Kat and the overall performance is better than at launch. This tablet is powered by an older processor Qualcomm Snapdragon 600 but it doesn’t really affect the overall performance. There is some feeling of lags especially on the Home screen and widgets, but I think this is due to the heavy LG UI. The LG UI on the GPAd 8.3 (2013) is heavy, childish, it feels like we are back in 2011! It's a shame because this beautiful tablet is “ruined” by a cartoonist UI. Apps launch quickly, browsing the web is fast, but it is the navigation through the UI that feels heavy. With LG you can customise almost everything, from the font to the android buttons. I am sure it is okay for some, but I want something nice and that performs well out of the box. That’s not the case with the LG GPad 8.3 (2014). The new LG GPad 7.0 (2014) is a different world! LG has learned that less is more and they have introduced a new UI which is more polished, refined and minimalist. The tablet is in fact very snappy and performs very well. There is slight lagging sometimes but nothing annoying. The feeling is that the LG GPad 7.0 is extremely fast and shouldn't be on the budget category. You will be really impressed by the overall experience of the new LG GPad 7.0 and the UI is very similar to the LG G3 smartphone. 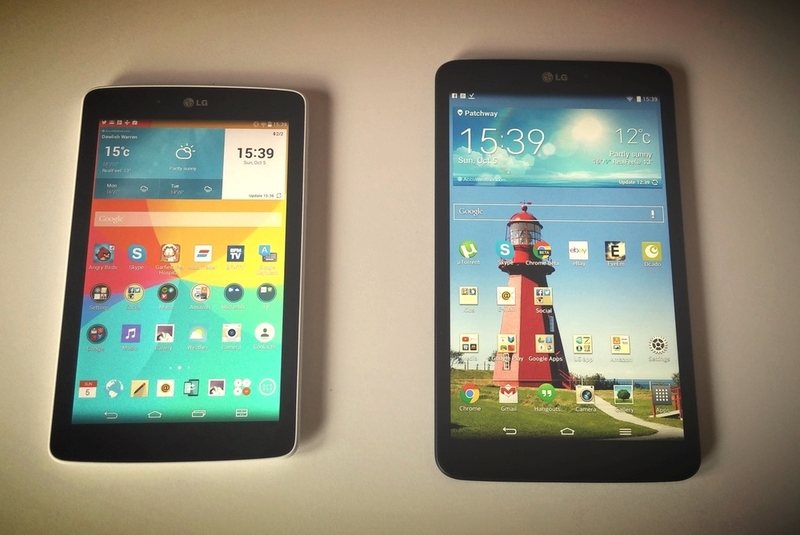 For me the clear winner is the LG GPad 7.0 (2014) especially because I really dislike heavy UI. This is an extremely difficult answer to give you right now. First I have to say that the LG comeback in the Android tablet world is perfect. The Korean firm has produced an excellent range of tablets at affordable prices. In fact the budget range of the 2014 GPads is far superior to any Samsung Galaxy Tab, Lenovo IdeaTab, Acer, etc…. Whatever tablet you choose, you won’t be disappointed. At £169 on Amazon, the LG GPad 8.3 (2013) is an excellent tablet that gives you a lot for your money. You get an amazing full HD screen, good performance, stylish look, excellent build quality, good speakers, and an OK camera. But you also have to deal with an average battery life and a heavy LG UI. However at £169 you will not find any better tablet right now. I will give this tablet a 4/5. For £74 the LG GPad 7.0 (2014) is absolutely amazing. It is fast, snappy, stylish, with great performances. But for £100 LG had to do some cuts. The great screen is not full HD but it is still excellent. The speakers are not that great and the camera is really bad and the build quality is good but not as premium as the LG GPad 8.3 (2013). On the other hand you get a much better battery life and a much nicer and polished UI. I have to give this tablet a 4.5/5 because you get a lot for £100. I hope this post will help you with future purchases. Hopefully soon LG will launch a more premium tablet range (especially with full HD screen) but so far LG is doing very good.